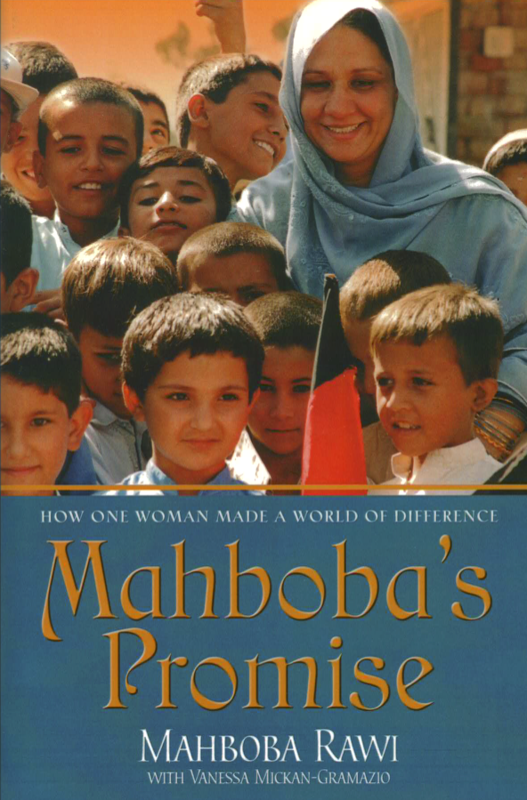 Mahboba’s Promise is an Australian non-profit organisation dedicated to helping disadvantaged women and children in Afghanistan. Mahboba’s Promise was founded by Mahboba Rawi, an Afghan refugee and now an Australian citizen, who has experienced first-hand the effects of a country torn apart by years of war and civil unrest. With Mahboba’s intimate knowledge of Afghanistan, Mahboba’s Promise was able to respond effectively and flexibly, to directly meet the needs of the country’s orphans and widows. Since then, Mahboba’s Promise has established schools, shelters and health clinics across Afghanistan and provided numerous sponsorships to widows and orphans in need. Our Vision is to provide a sustainable future within a secure environment for disadvantaged Afghan women and children. Mahboba’s Promise aims to provide effective overseas development aid to disadvantaged Afghan women, widows, children and orphans. We will achieve this through sustainable development programs such as the establishment of schools, health clinics and community facilities destined to be operated by local authorities and communities. Monetary donations of $2 or more to Mahboba’s Promise can now be directly claimed as tax deductions with the Australian Taxation Office. On receipt of your donation, we will issue you with a tax receipt for this purpose. Monetary donations to our appeals and for widow or child sponsorships are also tax deductible. The Association’s financial statements are audited annually. Our auditor is Robert Mayberry of Nexia Court & Co.
Our Annual Report for 2017-2018 is now available. The theme emerging from the year is ‘Saving Young Lives’. Over the year we have focused on creating self-sustaining projects that guarantee long term benefits to the communities we work with. 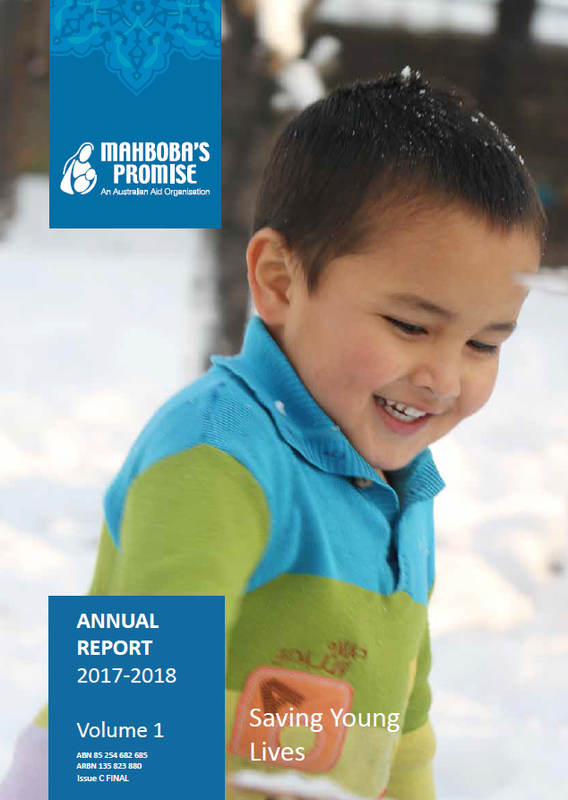 With improved efficiency in our operations and our dedicated staff, volunteers and management committee, we are looking forward to what Mahboba’s Promise can achieve in the 2018-2019 year. Mahboba’s Promise’s ongoing projects have provided education and homes for children, vocational skills and training for women, and support and health care access for the wider community; and over 20 years later, still stands as a respected and effective organisation bringing valuable, sustainable change to the people of war-torn Afghanistan. Mahboba’s Promise is an Association incorporated on 21 November 2001 in New South Wales under the Associations Incorporation Act, 1984. The membership of Mahboba’s Promise is drawn from Australians of all walks of life who have come together in a common purpose to help the people of Afghanistan. The Association has an authority to fundraise issued by the Office of Charities, Department of Gaming and Racing under the Charitable Fundraising Act 1991.